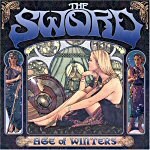 The Sword’s debut does cater to the non-metal crowd, but contrary to what the cynics claim, doesn’t alienate metal fans one bit. Whenever a new young metal band receives a big publicity push that attracts attention from beyond metal circles, the inevitable cries of foul from the diehard metal fans start. For example, if Early Man can attract attention from indie rock fans, why aren’t they also catching on to Wolf, who do the New Wave of British Heavy Metal shtick much better? Why does Wolfmother get all the advance buzz, and Witchcraft, a band supremely skilled at duplicating the sound of old Pentagram and Sabbath, have to toil away in relative obscurity? And why is The Sword getting name-dropped so often, when other stoner/doom bands like Nebula and High on Fire helped set the template from which the young band is so openly copying? It’s always the case, the devotees adore the unsung heroes, and despise the hot young “sellouts”, but once everyone gets beyond their own personal biases, most of the time, the music turns out to be not that bad at all. Early Man are nothing new, but enjoyable. The Wolfmother album kicks our collective arses from here to next Sunday. And The Sword, while lacking any original idea in the least, has recorded one fine, headbang-inducing beast of a debut record. Like their peers in the dark, turgid realm of doom metal, Austin’s The Sword (not to be confused with Canadian ‘80s metalers Sword) is completely unapologetic about shamelessly ripping off every other band before them. Doom remains one of metal’s most rigid disciplines; instead of frantic blastbeats, more emphasis is placed on single, booming kickdrum beats, ride cymbal driven rhythms that never go faster than a midtempo saunter, and most important of all, massive, massive doses of monolithic, distorted guitar riffs that boast all the speed and dexterity of a brontosaurus climbing out of a tar pit. It’s all about brute force, and although The Sword derive from the likes of Sleep, Sleep’s offshoot High on Fire, and of course, the mighty Sabbath, they do so with surprising flair on a record that draws in listeners with its deceptive simplicity. After the two minute instrumental “Celestial Crown” kicks off Age of Winters in grand style, J.D. Cronise and Kyle Shutt letting those massive riffs rumble in our collective guts and Trivet Wingo beating the holy hell out of his cymbals, the first half of the album quickly settles into a groove that seems more complacent than displaying the desire to blow listeners away. It’s all expertly executed, especially on “Barael’s Blade”, which hold our attention with its constant tempo shifts, but both “Freya” and “Winter’s Wolves” come close to sounding pedestrian, with their charmingly lunkheaded riffs and Cronise’s often double-tracked singing, which sounds a lot like Steve Brooks from Miami underground phenoms Torche, but lacking the skill at crafting catchy melodies. By the time the very Sabbath-esque (“Fairies Wear Boots”, anyone?) “Winter’s Wolves” climaxes with the hokey sound of howling in the background, we’re left wondering if the band has completely run out of ideas 20 minutes into the CD. All doubts about this band, though, diminish instantly, first with the piledriving “The Horned Goddess”, and then on the brilliant “Iron Swan”, a rampaging mini-suite that dares to rival anything off High on Fire’s fine Blessed Black Wings. After a faux-Middle eastern tinged intro with finger cymbals and acoustic guitar, the song instantly blasts off at double-time speed, shifts down to a sludge pace, kicks into a chuggin’ groove, then down again, then back to the thrash. It’s clear the band is having fun tossing in arbitrary tempo changes, and it’s reflected in the song, which bursts with life (listen for the great dual harmony solo, 3:36 in). From then on, the rest of the album hits another level: the epic “Lament for the Aurochs” is an inspired exercise in the mechanics of doom, not to mention being quite possibly the greatest metal tribute to an extinct cow ever recorded. After the ridiculously heavy instrumental “March of the Lor”, the foursome segue into the album’s best track, “Ebethron”, which boasts a swagger much like the band’s Southern brethren in Corrosion of Conformity, Cronise giving his best vocal performance, and those irresistible riffs just roping us in. Released on the uber-hip, major label-distributed Kemado Records, The Sword will face their share of catcalls from those in the underground, but not before winning over many others first. And what could possibly be wrong with that? After all, if Age of Winters inspires the non-metal fan to delve into the back catalogues of Black Sabbath and Sleep, then everyone’s all the better for it. If someone was looking for an introduction to the recent retro metal movement, they could do a lot worse than this fun CD, and those cynics who think The Sword have not earned their doom stripes might want to listen before rushing to judgment.